MANILA, Philippines - Impersonator Daniel Aliermo of Davao City was named grand winner of Ultimate Kalokalike Face 3 on Saturday, March 14, 2015 in ABS-CBN’s noontime show “It’s Showtime” after impressing the madlang people and the judges with his resemblance with the 'Unkabogable' comedian Vice Ganda. Daniel, a 31-year-old bested 14 other grand finalists of the show's hit celebrity look-alike segment. As the Ultimate Kalokalike, Daniel will bring home P300,000 and a special artista package. He was also awarded the Trending Award for generating the wildest buzz on social networking sites as he joined the competition in February. Melody Esther Loren Hodgson aka "Katy Perry" of Lapu-lapu Cebu, was declared the first runner-up and won P200,000, while Jay Mago aka "Bruce Lee" of Labo, Camarines, Norte, was named the second runner-up with P100,000. Aside from proclaiming the Top 3 Kalokalikes that were selected by the panel of judges composed of master impersonator Willie Nepumoceno, Dimples Romana, Jolina Magdangal and host Jhong Hilario, “It’s Showtime” also handed out special awards to finalists who made a lasting impact on the madlang people. The Kalokalike of Cesar Montano Rex Due of Novaliches, Quezon City received the Picture Frame Award. Meanwhile, the Kalokalike of Gloc9 Mark Kennedy Magno of Rodriguez, Rizal received the Kumarir Award for being the most improved contender in terms of impersonation, wardrobe, and overall look. 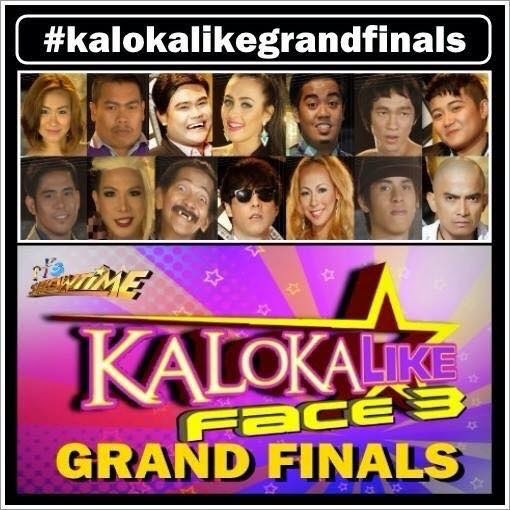 The look-alike contest’s grand finals was widely discussed online as the hashtag #KalokalikeGrandFinals topped the list of worldwide trending topics on micro-blogging site Twitter. Jonathan Garcia, a look-alike of Christopher de Leon and Nicki Minaj impersonator Jennifer Katayong were the competition's previous winners.